Basecamp Classic: Can I create Gantt charts with Basecamp? Basecamp supports spanned milestones & events, which can be used to create Gantt-style charts. 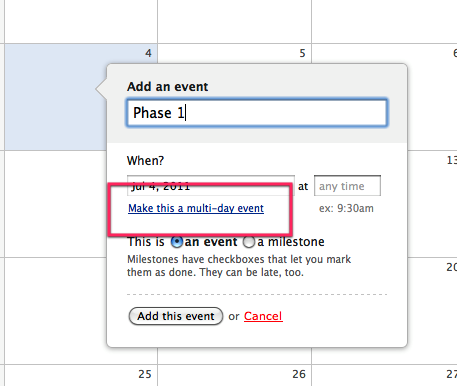 To create a spanned event or milestone, click the “Add a new event button”. On this menu, you can choose the ‘Make this a multi-day event’ option. This will let you set an end date for the event. Enter the end date, and Basecamp will create a spanned event. Your spanned events can even overlap.